The restaurant-as-coworking-space concept isn’t exactly new. Nor is the idea of double-duty public spaces. But man, are there a lot of options these days, even compared to a couple years ago. The match makes sense. According to one study, an estimated 5.1 million people worldwide will be using a coworking space by 2022. But not all of them can or want to pay $300 and up for a place like WeWork or Galvanize (more on that in a minute). At the same time, restaurant profit margins are thinner than the blade of a Wüsthof paring knife, and partnering with coworking companies is an opportunity for those businesses to make extra revenue. 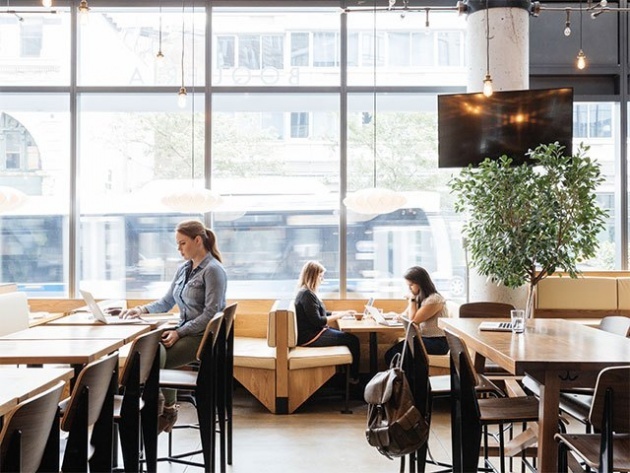 Restaurants that do so are typically higher-end places with no lunch shift, so if you choose to park yourself at one of these spaces, you’ll most likely be surrounded by posh decor and $150 bottles of wine. Buying food is not a requirement, and some places don’t even open their kitchens up to workers. Other restaurants offer lunch specials, and my favorite place is attached to the Gotham Market food hall in Fort Greene, Brooklyn. While there is some variation, hours for these coworking spaces are typically between 8:30 a.m. and 5:30 or 6 p.m., so don’t plan on showing up super early or leaving extra late. Of the benefits to this style of coworking, cost is probably the number one draw. Because these coworking companies don’t have to build out infrastructure (seating, utilities, etc. ), they can charge considerably less for membership fees. No, you won’t get perks like around-the-clock hours and private meeting space, but for those who just need an office away from the home office, the savings are enormous. With Spacious, for example, $129/month gets you access to all of the company’s locations, and the price goes down to $99/month if you sign on for an annual membership. Also in NYC, KettleSpace charges $99 for a month-to-month all access membership. Further south, a $150/month membership to Arlington’s CoworkCafe gets you full access and a $50 food credit. EatWorkPlay ranges from $5 for a day pass to $145 for a Premium membership with special weekend retreats. Free coffee and tea are pretty much always part of the deal. The restaurants benefit, too, since it allows them to put their unoccupied daytime space to use and make a little money from it.